07:58 Good morning and welcome to AUTOSPORT Live's as-it-happens coverage of the second winter Formula 1 test at Barcelona. 07:59 The 2013 F1 field is now complete, with the Williams FW35 unveiled in the pitlane just below us a few minutes ago. 08:00 Highlight of today for the smattering of fans already getting in position in the grandstands will be Fernando Alonso's first appearance of 2013 after sitting out the first test. 08:02 Alonso is among the first out, joined by Nico Rosberg's Mercedes, Esteban Gutierrez's Sauber, Max Chilton's Marussia, Daniel Ricciardo's Toro Rosso, Kimi Raikkonen's Lotus and Pastor Maldonado in the freshly launched Williams. 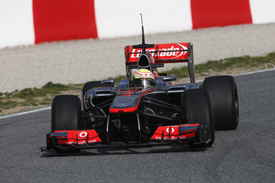 08:05 Gutierrez was the only one of that initial batch to do two installation laps. Everyone else came straight back in. 08:06 Paul di Resta has also warmed up the Force India, so the only cars yet to emerge this morning are the McLaren (today with Sergio Perez) and the Caterham (in Charles Pic's hands). 08:08 As ever, AUTOSPORT Live will be commentating for every moment of the four-day test, although we will pause for the lunch break that Barcelona has wisely decided is a good idea. 08:08 As the week goes on there will be chances to quiz our team of reporters, our technical expert Craig Scarborough and special guests from the pitlane. 08:09 We'll also be bringing you all the news from the paddock each night, plus daily analysis features. 08:14 All quiet on track at the moment. A promising engine growl below us turned out to be just a tease. 08:17 Di Resta is the first to go back out. 08:17 Chilton follows him in the Marussia. 08:19 Di Resta stays out, so the first time of the morning culd be imminent. 08:20 While di Resta tore past the pits at full speed, Chilton is cruising past on a constant speed run. 08:20 Di Resta returns to the pits after a second lap, so did not set a time. 08:22 Chilton comes back in as well. 08:24 Photographers are ushered aside as world champion Sebastian Vettel brings the Red Bull out, following sister team Toro Rosso's man Ricciardo down the pitlane. 08:26 Alonso and Gutierrez are back on the circuit too. 08:27 Ricciardo sets the first lap time of the day: a 1m46.712s. 08:27 Alonso goes onto a flying lap. 08:29 Ricciardo improves to a 1m45.277s as AUTOSPORT Live realises its eyesight isn't quite good enough for the distance from desk to timing monitors. 08:29 Alonso deposes Ricciardo with a 1m37.504s, but we're still a long way off 'serious' times. 08:30 Gutierrez returned to the pits without going for a fast lap. 08:31 Ricciardo comes back in so Alonso has the track to himself. 08:32 Alonso slowed to a 1m40.5s last time around. 08:32 Now the double world champion returns to the pits. 08:34 The AUTOSPORT team are examining pictures of the new Williams and offering analysis like 'pointy', 'stubby' and 'squished'. You can do the same with our FW35 gallery. 08:36 While Williams was launching the FW35, Ferrari was announcing UPS as a sponsor. Here's Alonso being pleased about it. 08:38 Maldonado takes the Williams back out. AUTOSPORT's Edd Straw (@eddstrawf1) will be talking to the team about the FW35 in the next hour. 08:39 Raikkonen is also on the circuit again. 08:40 Maldonado stays out and flies back the pits. Raikkonen's engine note at the back of the circuit seemed sedate but he now sounds like he's attacking the final corners with more enthusiasm. 08:40 Ricciardo sets out again. 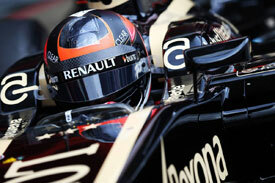 08:41 Raikkonen came straight back to the pits after what Lotus described as another 'shakedown' lap. 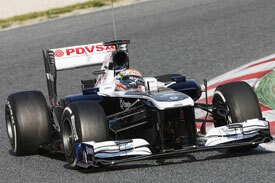 08:41 Maldonado, winner here last year, jumps to the top with a 1m29.550s lap. 08:41 We're still several seconds away from 'proper' times and only three men have done laps anywhere near flying. 08:44 Ricciardo has the track to himself and improves to a 1m41.181s. 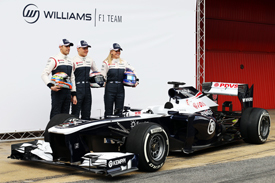 08:45 Hot on the heels of the unveiling of the new Williams-Renault FW35, the team has announced a partnership with global information services company Experian. Its logos will run on the side of the chassis and front wing as well as on the helmets and team kit. 08:46 Ricciardo improves to a 1m39.852s as Chilton comes back out. 08:48 Ricciardo pits. He leads the lap tally with nine so far. 08:48 On track now are di Resta, Chilton and Rosberg. 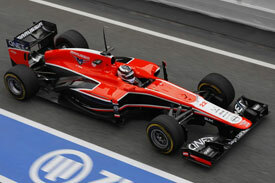 08:49 Chilton puts in Marussia's first flying lap, a 1m36.713s to go second. 08:50 Sergio Perez brings the McLaren out for the first time today. 08:51 Chilton is back in the pits. On track now are Gutierrez, Rosberg, Vettel and Perez. 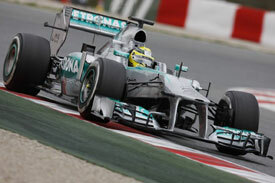 08:52 Mercedes' first lap time is a sedate 2m00.185s. 08:52 Press room latest: a man with a large earring and a big set of keys just walked in and pinched a lightbulb, but he did wipe his footprints off the table before leaving. 08:53 Day one of a test always has the quietest start. These cars haven't run on track for over a week, and in Williams's case, not at all. So the first hour is all about shakedown laps, aero tests and preparing for the work ahead. 08:54 Rosberg duly gets down to a 1m42s, but that's still 20s off the times we could see eventually. 08:55 This time last year, Adam Parr (@adam_s_parr) was leading Williams. Now he's wishing it good luck from afar: "Thrilled to see @WilliamsF1Team launch the FW35 and new partnership with Experian. Expecting great things from the team this year." 08:56 Everyone is back in the pits now. 08:58 A sudden flurry in the pitlane as Maldonado, Alonso and Raikkonen set off. 08:58 Down at Red Bull, a mechanic is sticking the pitbox markings down with typical F1 precision. A ruler and a sharp knife feature. 09:00 Raikkonen comes back in, but Alonso shoots past. His Ferrari is running a tall 'periscope' measuring device. 09:00 Maldonado improves the benchmark time to a 1m28.642s. 09:01 Pic is back out in the Caterham. 09:01 Quicker again from Maldonado with a 1m27.708s. 09:05 Di Resta rejoins and goes to second with a 1m30.218s. 09:05 Pic takes third on a 1m35.941s. 09:06 AUTOSPORT Live timing screen strategy now sussed: see time change on distant screen in front, swivel round at neck-straining angle to check what time actually is on screen above. 09:06 Di Resta comes back in after that brief outing. 09:08 Lap tally so far with just over an hour gone: Ricciardo leads the way on 12, Maldonado has done 10, 8 for di Resta, 7 for Gutierrez and just a handful for everyone else. 09:09 Pic now down to a 1m32.756s. 09:10 Pic now the only man on track. 09:12 Update from Force India (@clubforce): "The morning focus is on aero data collection." 09:14 Track all quiet now. If you want something to read during this lull, AUTOSPORT subscribers can enjoy a fantastic Alain Prost interview from our sister publication F1 Racing. 09:14 It includes Prost's fascinating verdict on the Senna move plus some surprising tales of drunken mid-1980s escapades with Elio de Angelis. 09:16 Pitlane update courtesy of Edd Straw (@eddstrawf1): "Williams is happy with the installation running and car checks. Moving onto aero work now." 09:17 Maldonado and Raikkonen break the silence and rejoin. 09:18 Rosberg is out again too. 09:21 Maldonado improves the top time to a 1m27.203s, three seconds clear of the rest. 09:21 Raikkonen sets his first flying lap of the day with a 1m30.196s, putting him second. 09:24 Meanwhile, in the AUTOSPORT archive gallery, despite cries for a Harrods McLaren shot, we're celebrating Andy Wallace's birthday with a Jaguar Le Mans pic. 09:27 Maldonado now has the track to himself. 09:29 Maldonado popped into the pits, paused quickly and rejoined, Di Resta is also out now. 09:31 Maldonado lowers the benchmark again to a 1m26.980s. He's now up to 19 laps for the morning. 09:33 Di Resta improves to second place, 0.9s off Maldonado's time. 09:36 Chilton sets a new best time of 1m32.087s in fourth place. 09:37 Chilton improves again to a 1m30.820s. 09:38 Pic, Ricciardo and Gutierrez are also out. 09:38 Two of the title favourites are among those making quiet starts: no times yet from Red Bull and McLaren and only two laps each from them. 09:42 Alonso swings in to the pitlane, pauses in the Ferrari pit area for some quick checks, then blasts back out. 09:43 Nico Rosberg sets the fastest time so far this morning, putting Mercedes on top with a 1m25.585s. 09:45 And faster again from Mercedes as Rosberg does a 1m24.520s, fastest so far by 2.4s. 09:47 That was a two-lap run on medium tyres from Rosberg. 09:49 Vettel takes second place on a 1m26.606s. Everyone has now set a time bar Gutierrez and Perez. 09:50 A 1m26.6s next time around from Vettel, who is also on medium tyres. 09:52 While the car is out, Red Bull has put its screens up across its pit area. The lengths teams go to in the interests of secrecy at tests was one of many fascinating topics covered in Craig Scarborough's (@scarbsf1) technical blog from Jerez. 09:52 Craig will be resuming his technical blog this week for the Barcelona test, and also doing an 'ask Scarbs' session in AUTOSPORT Live on Friday. 09:54 Alonso and Ricciardo are on the circuit at the moment. 09:56 Alonso comes into the pits, stops among the Ferrari mechanics, revs his engine hard several times and then stops with the engine running for a spell before rejoining. 09:58 Alonso pops back into the pits. Rosberg and Maldonado are now out. 10:06 Quite a busy track with di Resta, Pic, Chilton, Alonso and Gutierrez out, but all lapping slowly or coming in and out of the pits. 10:07 Di Resta is the fastest man out right now, doing 1m32s. 10:08 Gutierrez improves to a 1m33.518s. 10:09 And Pic does a new best time too in the Caterham with a 1m27.534s. 10:10 We have our first red flag. 10:10 Gutierrez's Sauber has stopped at Turn 7. 10:13 A truck and a lot of people in orange are on the scene, plus a Sauber blanket. 10:14 Swift work. The Sauber is lifted onto the flatbed and the marshals and course car are already departing. 10:18 The truck is on its way back so action should resume shortly. 10:19 Perez and Maldonado get things back underway as the green flag comes out. 10:21 Chilton also sets off. 10:22 McLaren's first time of the day is a 1m28.062s for Perez. 10:25 And Perez now goes quickest with a 1m24.362s, a tenth up on Rosberg. 10:26 Perez is on medium tyres, which have been used for all this morning's top times so far. 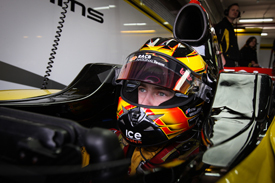 @OfficialSF1Team: "The team checked the fuel system, and as a result, @EstebanGtz ran out of fuel." 10:29 Perez has pitted again. Chilton is briefly solo on the circuit before Raikkonen comes out in the Lotus. 10:30 Vettel is also out again. 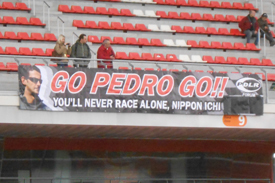 10:31 Pedro de la Rosa is not running at Barcelona, but his fan club is still out in force. 10:32 In other Banner Watch news, some Raikkonen fans with Finnish flags are in place opposite Lotus. 10:32 Raikkonen improves to a 1m28.142s and goes seventh. 10:34 Raikkonen is now lapping in the 1m30s as press room conversation moves on to the topic of Andrea de Cesaris. 10:35 Alonso does a 1m26.538s to go fourth. 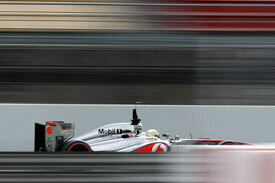 10:37 Alonso's pace drops back to 1m30s and 1m31s thereafter, while di Resta is the fastest man currently out on 1m27s. 10:37 Ricciardo sets a 1m27.161s to go seventh. 10:39 Ricciardo improves again with a 1m25.892s. 10:40 What Lotus is up to: "Back in now for info download and change of parts for evaluation on the next run"
10:40 Quicker again from Ricciardo, now a 1m25.441s. 10:43 Ricciardo is now doing mid-1m26s lap. He is using the hard tyre on his Toro Rosso. 10:49 Ricciardo ends his run, Gutierrez sets out, Edd Straw gets the inside line on the new Williams design from technical expert Gary Anderson, and AUTOSPORT Live pauses a moment to write a Stephen South caption for our archive gallery later. 10:49 A new best time from Gutierrez, who does a 1m28.695s. 10:52 Gutierrez jumps up the order to fifth on a 1m26.079s. Perez, Alonso and Maldonado are out keeping him company now. 10:55 Alonso goes fastest of all on a 1m24.162s. 10:58 Alonso's time on top didn't last long, as di Resta now does a 1m24.144s in the Force India. 11:02 The Force India is running medium Pirellis. 11:04 A recap with three hours gone: Di Resta leads the way on a 1m24.144s, followed by Alonso on 1m24.162s, Perez on 1m24.362s, Rosberg on 1m24.520s and Maldonado on 1m25.332s. 11:04 Ricciardo, Gutierrez, Vettel, Pic, Raikkonen and Chilton fill the remaining positions. 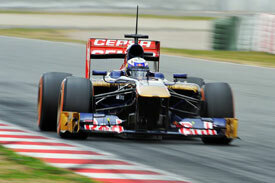 11:05 Maldonado has done the most laps with 37, then Alonso on 33, Di Resta on 31 and Ricciardo on 30. 11:05 Vettel has done fewest with nine, then Perez on 10 and Raikkonen on 11. 11:06 Perez spent a long spell in the garage this morning after McLaren's initial installation laps, but the team told AUTOSPORT this was due to a "lengthy reset in the garage" after aero tests rather than a mechanical problem. 11:08 Perez is out again now, lapping in low 1m25s. Ricciardo is doing mid 1m26s. 11:09 Gutierrez's first flying lap is an improvement as he does a 1m25.846s. 11:11 Vettel is setting off again in the Red Bull. 11:15 Vettel produces a new benchmark of 1m24.039s on medium tyres on his first flying lap of that run. 11:16 Di Resta and Raikkonen are now the other men on track with Vettel. 11:16 That's one F1 race driver in the bag for an 'Ask AUTOSPORT Live' readers' Q&A session later in the week... Will let you know who and when shortly. 11:17 Raikkonen now snatches the fastest time away frmom Vettel with a 1m23.571s. That's the first sub-1m24s lap of the day and puts the Lotus nearly half a second clear. 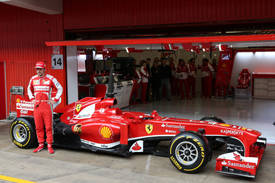 11:18 That new benchmark from Raikkonen came on hard tyres and was followed by a 1m23.9s. 11:19 Raikkonen now pits after that two-lap burst. 11:21 Alonso closes in on Raikonen with a 1m23.626s. 11:23 Alonso is also out on hard tyres. He backed off on his second lap. 11:26 Alonso now comes back into the pits. 11:27 Gutierrez keeps chipping away at his best time, trimming it down to a 1m25.172s and edging up ahead of Maldonado to seventh. 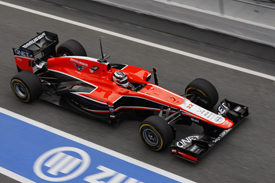 11:29 At the bottom of the heap, Chilton improves to a 1m28.442s in the Marussia. 11:30 And another little improvement from Gutierrez as he does a 1m25.136s, 0.036s quicker than previously. 11:31 Chilton goes a little quicker too with a 1m28.058s. 11:34 While Chilton continues in mid to low 1m24s, Vettel brings the Red Bull back out. 11:35 Vettel immediately goes quicker again with a 1m23.290s, putting Red Bull in first place by 0.281s over Raikkonen. 11:37 The world champion was on hard tyres again for that run. He backed off by 5s next time around. 11:39 Ricciardo next to improve with a 1m24.406s in sixth position for Toro Rosso. 11:40 Vettel now back up to speed and lapping in 1m24.3s. 11:41 Ricciardo makes another small improvement as he laps in 1m24.279s. 11:43 Now on track: Di Resta, Ricciardo and Pic. 11:43 Di Resta is the only one lapping at a competitive pace as he does a 1m24.592s. 11:45 Alonso heads out of the pits as di Resta ends his run. 11:46 Unlike Jerez a fortnight ago, Barcelona does offer a lunchbreak, starting in 15 minutes. 11:46 This makes us happier than we were earlier when everything was late opening and we were grouchy. 11:48 The bottom four on the list all hit the track: Gutierrez, Maldonado, Pic and Chilton. 11:53 Maldonado vaults to fourth with a 1m23.733s, less than half a second off Vettel's best. 11:54 And as soon as we say that, Vettel improves. A 1m23.046s puts the reigning champion more than 0.5s clear at the top of the timesheets. 11:55 Heading into the final five minutes of the first morning here at Barcelona and we have six cars on track: Vettel, Raikkonen, Alonso, Perez, di Resta and Chilton. 11:56 Make that seven, as Ricciardo heads out in the Toro Rosso. 11:57 Vettel set that time on the hard compound incidentally. 11:58 Alonso, Perez, Ricciardo and Raikkonen are also using Pirelli's hard option. 12:00 The chequered flag flies just as Ricciardo improves to a 1m23.884s. 12:02 Sebastian Vettel sets the pace on the opening morning of the first pre-season test at Barcelona then, with Kimi Raikkonen second and Fernando Alonso - getting his first taste of the F138 - third. 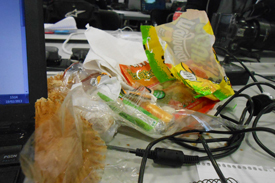 12:04 The AUTOSPORT Live team is now very excited about the opportunity to have lunch, a luxury we missed at Jerez. We'll be back at 14.00 local time for the resumption of the first day. 12:06 In the meantime, you can read up on the morning's events here. 13:01 Welcome back. AUTOSPORT Live is lunched-up and raring to go for the afternoon. 13:03 In fact, we've beaten the F1 pitlane. Green flags are waving but no one looks like venturing out right now. 13:06 AUTOSPORT wasn't idle during lunch - Edd Straw heard why Williams is sure its FW35 exhuast outlet is legal, and we then spent some time making it look pretty. You can read the story (and admire the pictures) here. 13:10 There was also an impromptu book review and, courtesy of TV man Will Buxton, a recommendation of melting Stilton in mince pies at Christmas. We're not convinced. 13:14 The media centre resonates to the sound of the RB9, but it turns out to be a tease as the car shuts down. Still quiet out on track. 13:19 Another thing we achieved during lunch was to look at all of last year's times at Barcelona. Sebastian Vettel's 2013-best, which was set on the Pirelli hard tyres, is already faster than anyone went on the same compounds last year. 13:20 Fernando Alonso breaks the silence and heads out for Ferrari. 13:24 Alonso follows up an opening 1m28s effort with a 1m26.716s on hard tyres. 13:24 Vettel, pacesetter in the morning session, heads out to join Alonso. He's also on hards. 13:26 Alonso brings a three-lap stint to a close just as Gutierrez and Pic head out. 13:30 Gutierrez was the busiest man of the 2013 grid at Jerez, and he's clocking up the miles again today - his first flying lap of the afternoon takes him past the 40-lap mark. 13:31 After a quiet start to the morning session, Perez heads out for McLaren. 13:34 Max Chilton and Charles Pic head out in quick succession. 13:38 Another thing we spent our lunchtime doing is studying Monkey Seats, with Williams in particular sporting a few interesting tweaks. They're just one of the design features our technical expert Craig Scarborough will be happy to discuss in an 'ask Scarbs' session in AUTOSPORT Live on Friday. 13:39 No serious times set so far this afternoon. We have Vettel, Maldonado and Perez on track at the moment. 13:42 Williams technical director Mike Coughlan is confident that his team will not suffer from not running the new FW35 at Jerez two weeks ago.That no one completed more laps than Pastor Maldonado this morning suggests that he has got a point when it comes to reliability testing. "To track test for reliability is a thing of the past," he explained to Edd Straw earlier. "You’ve got to get to the point where you are pretty confident that what you are bringing to your car is safe and reliable. Jerez was very cold and very aggressive on the tyre. A lot of people were system checking. We said that if we can be confident about our system we have got the same amount of testing as everyone else. We have come here to concentrate on performance." 13:43 Our first improvement of the afternoon comes from Kimi Raikkonen - he stays second but moves to within 0.079s of Vettel at the head of the timesheets. 13:47 Banner Watch has spotted some Hungarian and Finnish support near the exit of the pitlane. 13:50 Our second red flag of the day, and Edd Straw informs us it's Chilton or Pic. 13:52 It's the Frenchman who has caused the stoppage. He's pulled off on the inside of Renault, just before the long right-hander of Turn 3. 13:53 A very speedy response from the Barcelona rescue crews. A low loader is already alongside the Caterham, and given the proximity to the pits we should be underway soon. 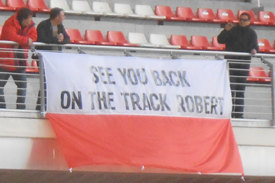 13:58 In the meantime, Banner Watch is very keen to show a photo of the Kubica tribute. 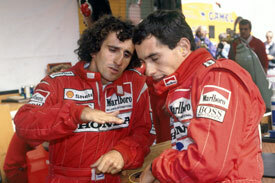 The Pole features in AUTOSPORT's list of one-time grand prix winners, falling under the category of 'Can they add more?' alongside Heikki Kovalainen, Nico Rosberg and Pastor Maldonado. From Jean Alesi in Canada 1995 to Innes Ireland in 1961, every driver to have won just once is included. You can read the full feature, here. 13:59 No oil has been reported, the Caterham is on its way back and we should be back underway shortly. 14:01 We are indeed. The Caterham is being unloaded in the pitlane and the green flags are waving once again. 14:03 Sergio Perez, Pastor Maldonado and Sebastian Vettel are the first men back out. 14:06 Banner Watch is on song at Barcelona. We can confirm reports that one of the morning's two Finnish flags has now been furled and (presumably) taken home. 14:07 Alonso doesn't improve his overall time, but he's fastest of everyone in the first speed trap, sets a personal best in the second and is also green in the third sector. 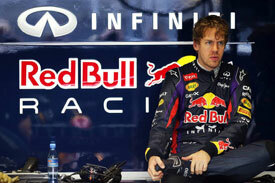 14:12 @redbullf1spy: "Slow start but Seb made up ground, finished the morning in P1. Relationship between laptime and proximity of lunch not fully established." 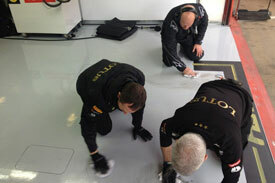 @Lotus_F1Team: "Floor being cleaned means Kimi's out on track (on orange tyres)." 14:15 We've been looking into Caterham's earlier stoppage. The team isn't sure what caused it yet, but can confirm it was a mechanical problem. 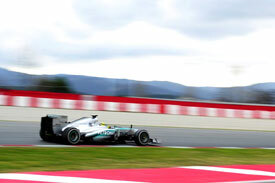 14:23 Mercedes has only completed 19 laps so far today, the least of any team. The team reports that gearbox work took longer than planned and has restricted Rosberg. 14:25 Perez follows Alonso into the pits, leaving just di Resta and Chilton out on circuit. 14:29 Talking of Rosberg (see 14.23), he's just headed out for Mercedes. Checks on the gearbox required it to be removed earlier, causing the delay. 14:34 There hasn't been much in the way of improvements this afternoon, but Nico Rosberg has just gone faster on his first run. On hard tyres he drops down to a 1m24.020s. 14:45 Earlier on (13.38 to be precise) we mentioned Monkey Seats. We were of course referring to the small winglet on the top of the beam wing, not an actual monkey seat. That might all sound obvious were it not for AUTOSPORT editor Charles Bradley and his alluding to Jocko Flocko, the only monkey to win a motorsport race (to the best of our knowledge). Flocko, a Rhesus monkey, ran with Tim Flock during his 1953 Grand National win at Hickory Motor Speedway. He was, according to Wikipedia, retired two weeks later after becoming scared when looking into the wheel wells. Don't say we don't do random trivia! 14:47 Gutierrez shaves off 12 thousandths of a second from his previous benchmark, thanks largely to a personal best in sector one. 14:49 For AUTOSPORT subscribers, Craig Scarborough has got under the skin of the Williams FW35. It may have been the last 2013 car to launch, but several intriguing innovations mean it was well worth the wait. 14:52 Max Chilton, out on the medium compound, works his way down to a new best of 1m26.753s. 14:53 The Briton follows that up with a 1m27s and a 1m31s. Just him and Alonso on circuit as we near the final hour of the first day. 15:00 Alonso heads in, but Chilton is still out for Marussia. 15:01 Except of course as we write that he heads in, leaving Raikkonen and Ricciardo as the track's only two occupants. 15:04 The CCTV cameras pan round just in time for us to catch Sergio Perez making a practice start at the pitlane exit. He'll be keeping Ricciardo company after Raikkonen concluded his short run by heading in. 15:10 Into the final 50 minutes and only Sergio Perez is out on track. 'Move on up' meanwhile is playing from a mysteriously cordoned-off section of the media centre. 15:13 A V8 rumble from barely six feet beneath us can only mean one thing: Vettel is heading back out. 15:15 The reigning world champion is on the medium compound incidentally, as is Perez. The pair have Maldonado and di Resta for company. 15:19 Vettel is our first man in the 1m22s, as he shaves a few fractions off his earlier benchmark. 15:20 Nico Rosberg has also improved, dropping down to a 1m23.879s. 15:22 Vettel's lap was set on mediums incidentally, while Rosberg's came on hards. 15:23 As we move into the final 40 minutes, a quick lap count for the day: Alonso leads the day with 89, ahead of di Resta (70), Maldonado (68) and Chilton (59). 15:24 At the other end Raikkonen has completed the fewest laps (32), followed by Rosberg (42), Pic (49) and Ricciardo (55). 15:26 Ferrari on Twitter: "Still 45 minutes available. Testing mainly with hard compound." 15:27 And suddenly there's a swell of activity, with seven cars - the most we've had all afternoon - on track. 15:29 Something we said? Gutierrez, Rosberg and Ricciardo all head in, with Chilton moving in the opposite direction. 15:33 Chilton, on mediums, improves in the second and third sectors, eventually shaving six hundredths of a second from his previous best. 15:35 He's fast again through sector one on his next flyer, but his lap trails off and he loses six tenths of a second in the third sector alone. 15:39 After a short stop Vettel heads back out for Red Bull, joining Rosberg and Perez. 15:40 Rosberg is on a flyer - he's green in sector one and fastest of everyone in the middle sector now. 15:41 Sure enough, he improves. 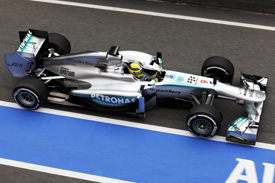 In fact, Rosberg is now the day's fastest man by more than three tenths of a second. 15:41 His 1m22.616s, set on mediums, also included an overall best in the final sector. 15:44 Raikkonen, on fresh mediums, is also flying. A 1m22.623s lifts the Finn into second. 15:45 Raikkonen just seven thousandths of a second shy of Rosberg. His lap included an overall best in sector two and a personal best in the final sector. 15:47 Alonso improves to a 1m22.952s and knocks Vettel down from third to fourth. 15:48 Still seven of the 11 cars present on track at the moment in this late rush. 15:53 Although there are plenty of cars on track, improvements don't appear to be on the cards at present. 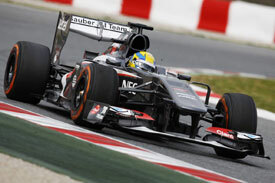 Alonso, Maldonado, Ricciardo and Gutierrez are all lapping in mid-1m27s. 15:59 Into the final half a minute, barring shocks it will be Rosberg on top at the end of the day by just 0.007s over Raikkonen's Lotus. 16:01 And that's the end of day one at the Circuit de Catalunya. 16:02 Rosberg's late 1m22.616s lap ends the day quickest for Mercedes. 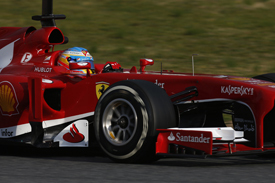 16:02 Alonso tops the lap count as the Spaniard clocks up 110 tours on his first day out in the 2013 Ferrari. 16:04 We're off to hear from the teams and drivers in the paddock, so stick with AUTOSPORT for the reaction later this evening. 16:04 And join us for more live coverage from 08:00 GMT tomorrow.